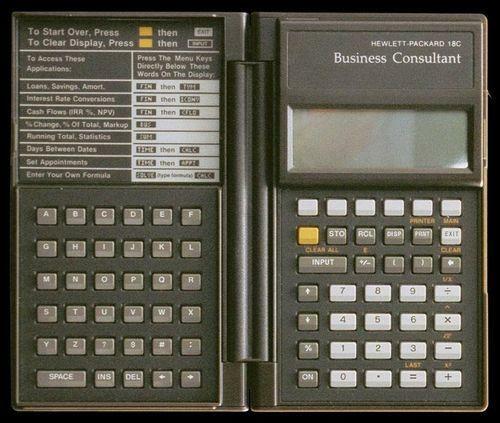 HP Calculators Timeline » HP 18c Business Consultant. The HP 18c was the first in a series of "clamshell" calculators produced by HP. The HP 18c opens like a book with two keyboards facing each other inside. The HP 18c included graphing and a date-time-alarm feature similar to a personal organizer. The 18C had 2K of memory and it used algebraic logic with parentheses (but no precedence) and the multi-line display. I mistakenly put wrong batteries in my old HP-18c. Now it doesn&apos;t work. Can it be fixed? I have heard of one individual who did the same, then replaced the batteries with the correct ones and it worked. However, I suspect he was extremely lucky. This particular calculator design is nearly impossible to fix. It is still valuable and can easily be sold. Why? The battery door is valuable to other Hp 18c, 19b or 28c/s calculator users. The Hp 18C (and 19B, Bii, 28c and 28s) all use N cell batteries. These are 1.5 Volt and NOT 12V like some garage door controllers use that are very nearly the same size and dimensions. Of course if you use the 12 Volt batteries (and more people have done so than I care to count), you put 36 Volts where only 4.5 volts is designed and you (not you, but others) ruin the fine vintage calculator. Remember N cell, often called instrument batteries. Usually these batteries are on the costly side of $5 per pair and are sold in pairs. You only need three, so the fourth is often put away, never to be seen again. I want to use this for an upcoming test because of its date and statistical functions, but whenever I press the ’sum’ key I get "machine reset". All other keys and functions seem to be ok. It has passed both the general self-test and the keyboard test. Any thoughts appreciated. Thanks. The problem was I ran out of memory - 12K will take you only so far. Did a memory purge and all is working as it should.